Pretty much everyone knows that I’m pretty much always cold, and I’m doing everything I can this winter to keep from feeling cold all the time. I’ve been wearing handknit socks most of the time because they are so much warmer than commercially made socks, but I feel a longing to knit and crochet slippers to wear with those cozy socks for an extra layer of warmth and comfort. 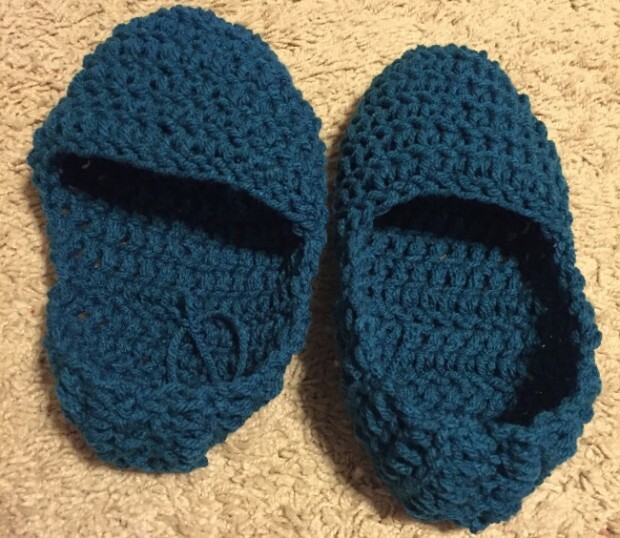 My publisher, Stackpole Books, recently released a book by knit and crochet designer Kristi Simpson, 25 Cozy Crocheted Slippers, which is going to help me reach my goal of having cozy feet. 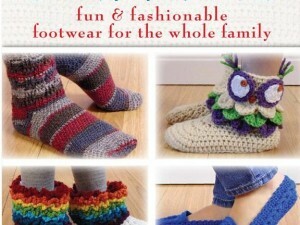 The book includes patterns for babies, kids, men and women, so you can cover everyone’s feet with fun crocheted goodness. I agreed to review this book with the major caveat that I’m not great at crochet. And it shows. I’m also maybe not the best at reading directions or trusting patterns, but we’ll get to that in a minute. There’s a nice range of patterns here, from straight up socks to little adornments for your feet when you walk on the beach. There are pint-sized puffy rainbow boots, which I’m sure my daughter would love, as well as slippers inspired by frogs, owls and cats. There are classic dad slippers, fuzzy little slipper socks, tall boots you will want to spend all winter in, and more. Check out all the patterns on Ravelry. 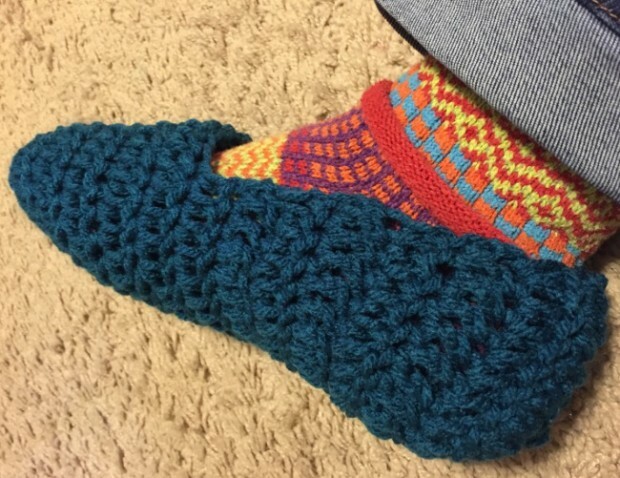 I started with a pair called the “Simply Divine Moccasins,” which are billed as “super easy and fast to crochet.” Which they are. I think it took me a little over an hour to stitch one, and I’m not very fast. The only problem is, there was a direction I didn’t quite understand. I looked in the techniques in the book and didn’t find it listed, so I headed to the Internet, and it told me to do something different from what she was wanting, and I don’t think I even did that right, so my first slipper came out a little odd. And large. My wonky slipper on the left and the much improved second version on the right. Then I read the section called “How to Read My Patterns” and it explained what I actually needed to do. When I did that, I came out with a slipper that actually fits pretty well. The good news is I can rip the other one out and fix it without too much time or trouble. 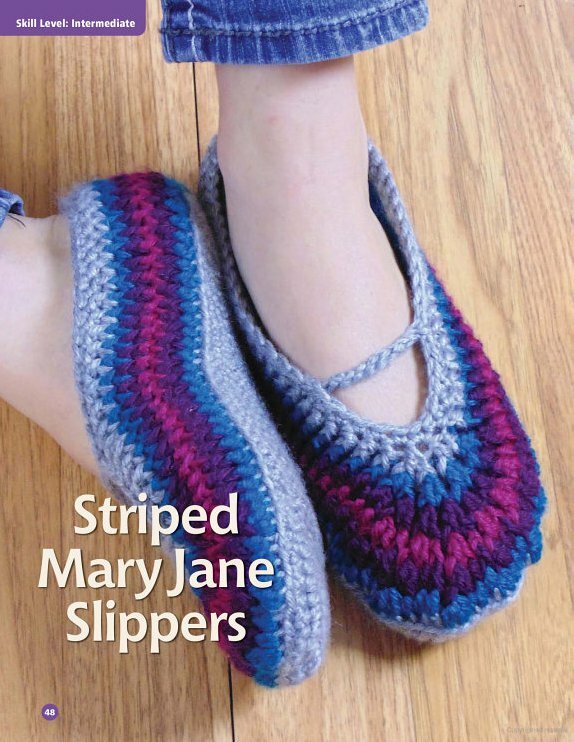 I want to try the Mary Jane style slippers next, and maybe those rainbow boots for the girl, too. The patterns do have skill level ratings, and a stitch guide at the back should help you with any stitches you don’t already know. As a not-great crocheter I was able to pick it up and follow along with the simple patterns easily, even with my little problem moment. 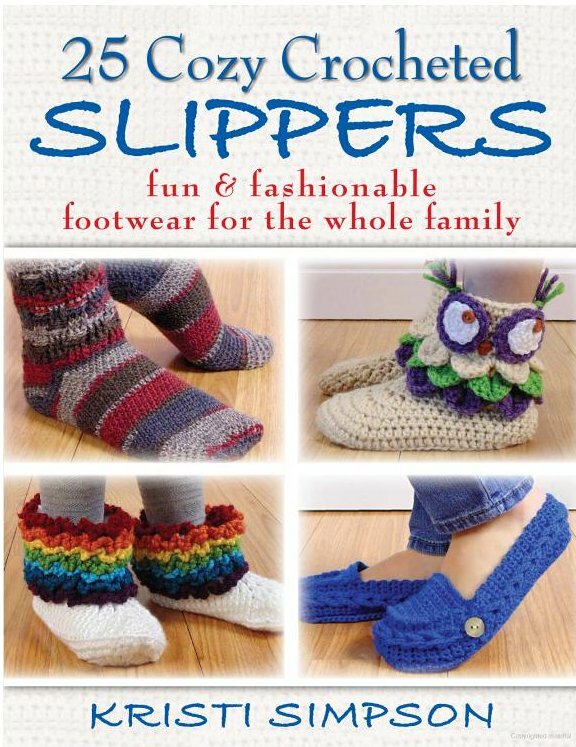 If you have a little bit of comfort with the basics of crochet, or a lot more comfort than I do, this is a great little collection of slippers for everyone on your list who needs cozy toes this winter. And that’s everyone, right? Do you crochet? Have you ever made slippers? I’d love to know what you think of this collection!